Printing is one of the most overlooked areas of a company’s operating costs. According to recent studies, it can account for 1-3% of an office’s overall budget. This can equal hundreds or thousands of dollars. Allen Business Machines can help you print more productively and cost-effectively. We offer first-rate office equipment and services to help you produce the documents you need while reducing your expenses and waste. Learn about ABM’s selection of high-quality multifunction printers and other office equipment. With our Managed Print Services, you can understand and control your printing processes—and the costs that go with them—more accurately and reliably. 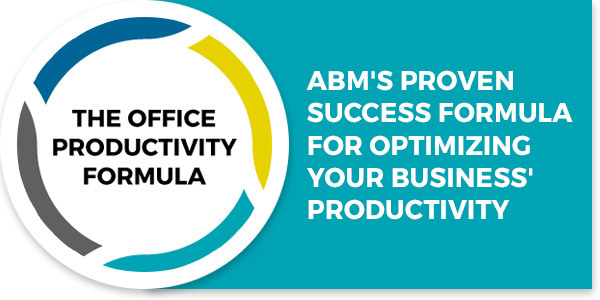 ABM doesn’t stop at offering solutions for your printing fleet. 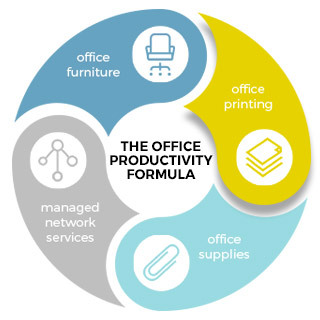 Our Productivity Formula can meet many more of your office needs. Check out these sections of our website to learn more. Protect your sensitive data and ensure that your applications, desktops and servers function properly with ABM’s Managed Network Solutions. ABM can sell and install furniture to help your business work more comfortably and profitably.